This is the first identification of a chiral hydration structure under ambient conditions for a biological molecule, say Poul Petersen of Cornell University, and his colleagues. They speculate that the helical ‘spine of hydration’ threading down the DNA molecule might have biological implications, for example in determining how easily drugs bind to DNA. 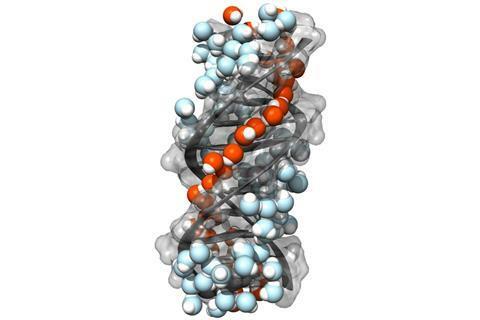 It has long been known that DNA may be surrounded by a chiral arrangement of water molecules. However, previously that has only been seen in solid-state crystal structures of the hydrated molecule.2 There was no guarantee that the same arrangement would be preserved in the liquid cytoplasm of living cells, where in general the hydration water molecules are much more mobile. Petersen and colleagues have shown that this is the case using the spectroscopic technique of sum-frequency generation (SFG). Here two incident photons, of visible and infrared wavelengths, interact with a sample so that it emits a photon with the sum of the two incident frequencies, when this coincides with a resonant frequency of the sample. The process only works when the sample has no inversion symmetry. That’s generally the case at a surface, and so SFG is usually a surface-specific technique. But it is also true for chiral samples even in the bulk. Getting a strong signal in that circumstance is very challenging, however. ‘We spent 3-4 years figuring out how to do the experiment,’ says Petersen. The researchers probed a sum-frequency band corresponding to the frequencies typical of O–H stretching vibrations in water, so that they could study the hydration environment of DNA. They studied two types of DNA molecule: double-stranded, self-complementary 24-mers with 12 repeating units of AT and GC base pairs respectively. Petersen and colleagues saw several bands in the SFG spectra, which they could assign to different types of water molecule. One band seems to correspond to O–H groups not involved in hydrogen bonding, which the researchers think are present in water molecules hydrogen bonded only via one of their O–H groups in linear chains that thread their way along the spiraling minor groove of the DNA duplexes. This groove is too narrow to allow other water molecules access to the dangling O–H groups. The confinement, they say, is slightly tighter in the minor groove of (AT)12 than that of (GC)12, so the precise details of this ‘chiral hydration spine’ are likely to be somewhat dependent on the DNA sequence. Thomas Elsaesser of the Max Born Institute in Germany, a specialist on the spectroscopic study of biomolecular hydration, says that the findings are persuasive but perhaps not entirely surprising given the previous results for crystalline DNA. The minor groove chiral spine, he adds, is only a small part of the entire hydration shell, most of which will be much more mobile. Petersen says there are proteins that bind directly to the minor-groove waters, ‘So the water structure should be important for that’.